Laura, who didn’t like to sit and make fine stitches as a young girl, became very good at her handicrafts later in life. She made beautiful quilts, lovely button holes for a job in town, and handicrafts to help earn money to send Mary to the blind school. 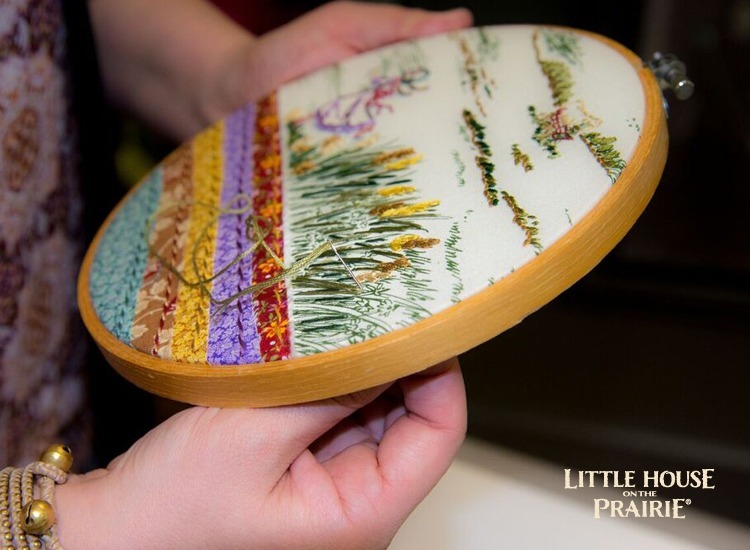 Sewing was part of her life and now we celebrate that lovely tradition with this hoop project. 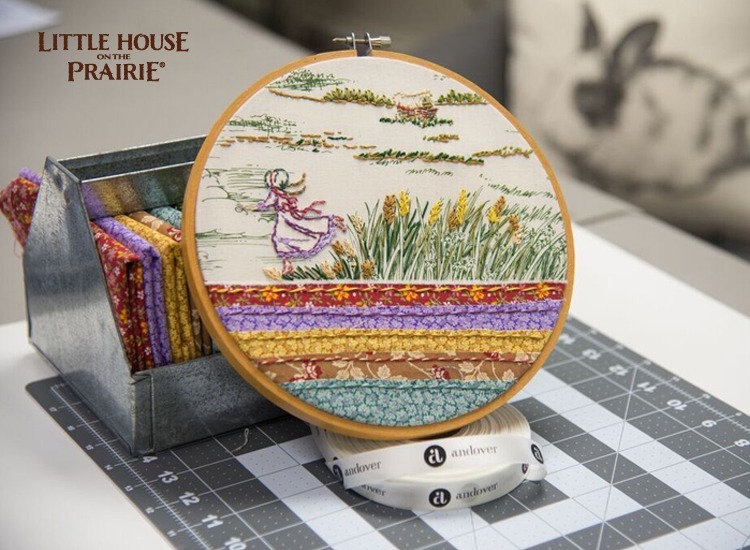 Follow the directions by @wildboho and create your own Laura Ingalls Wilder-inspired sampler project. Download the Supply Checklist Printable here before you begin. These are all the supplies and thread colors that were used for this DIY project. 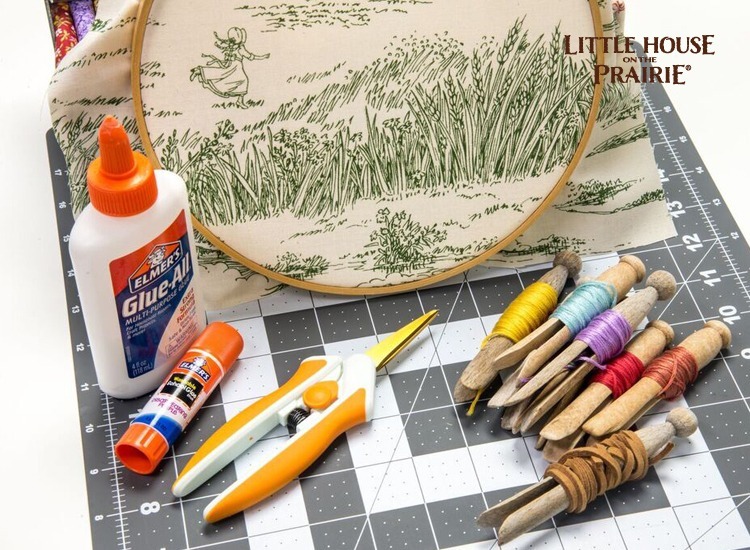 You can purchase the beautiful Little House on the Prairie® collection of fabrics online here. Step 1: Place hoop where desired on the background fabric and trim, leaving approximately 1-2” excess fabric all the way around your hoop. Set aside. Step 2: From the 5 Fat Quarters, cut or rip 5 strips of fabric approximately 1-½” wide by 9” long. 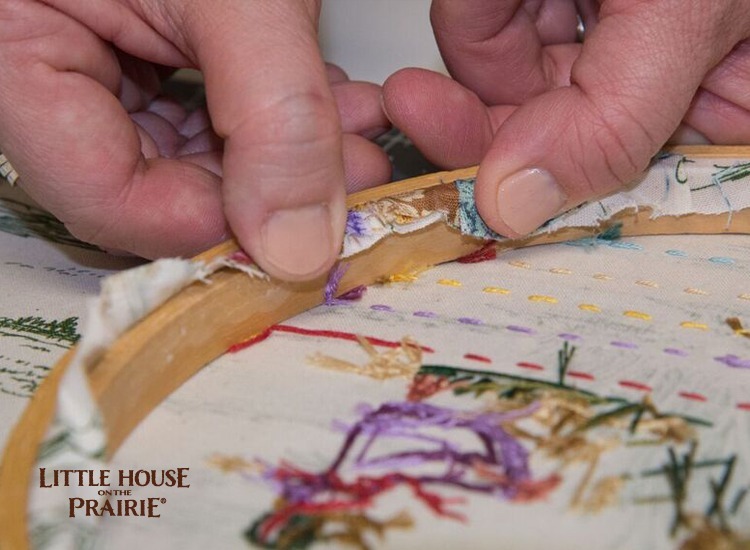 Step 3: To each fabric strip, apply glue from the glue stick and press on to the fabric. Begin with the top strip and layer all 5 pieces of fabric, working towards the bottom of the hoop. Step 4: From the Laura Ingalls fabric, choose one “Laura” and trim out of the fabric. Do not cut too close to the design at this point. 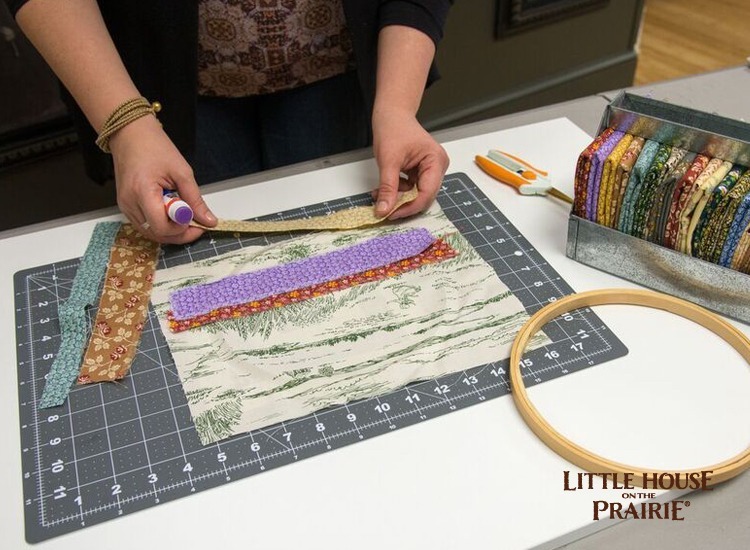 Once you have cut out “Laura,” trim a piece of Heat ‘N’ Bond to her size and follow the directions for applying that to the fabric. You want the paper backed side of this to be on the back of Laura. 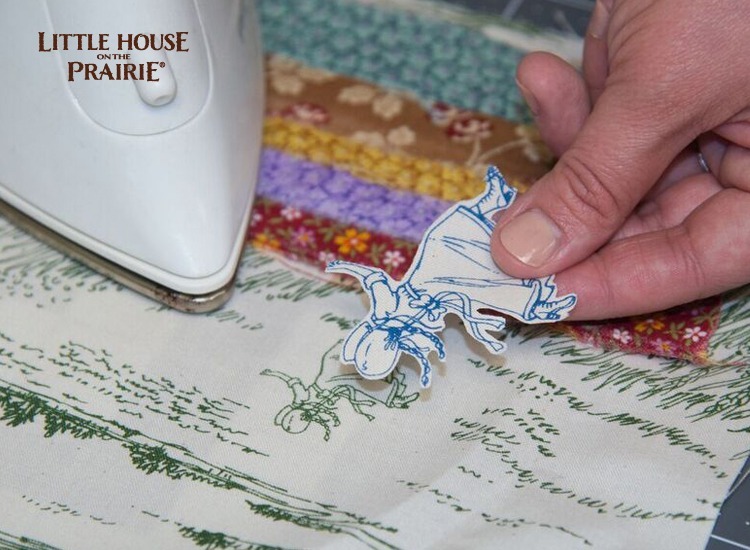 Peel off the paper and place her where you want her to be on the fabric. Iron her to the fabric. Secure the hoop onto the fabric, tightening the fabric as you tighten the hoop. Step 5: Embroider your hoop using the below stitches. 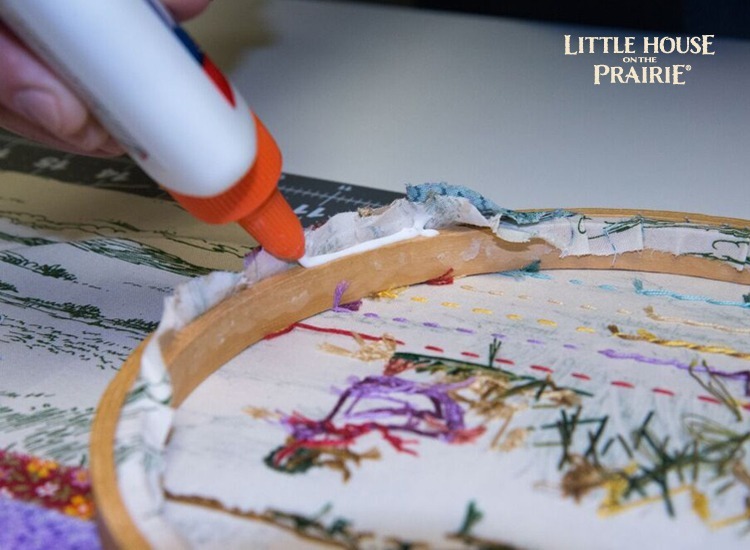 Step 6: When finished embroidering, trim the fabric around the hoop to approximately ¾” and glue the fabric to the wood hoop. Let the glue dry and hang your hoop with a piece of decorative ribbon or place on a shelf! 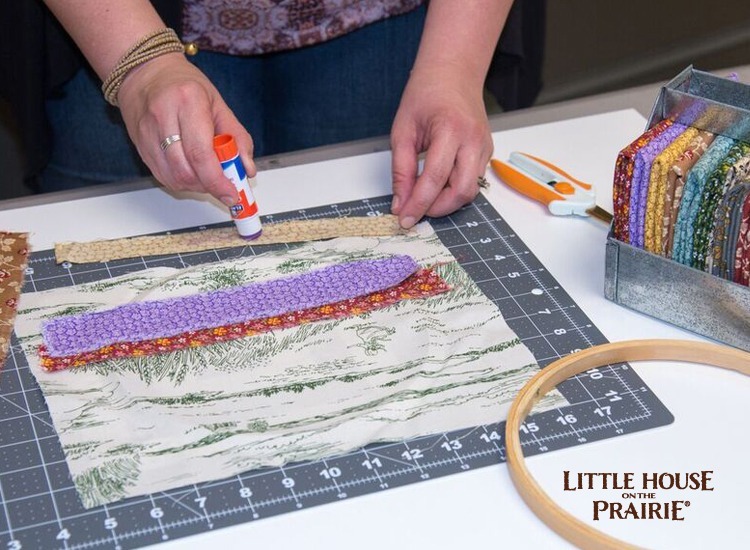 We can’t wait to see what you create with your Little House on the Prairie fabrics. 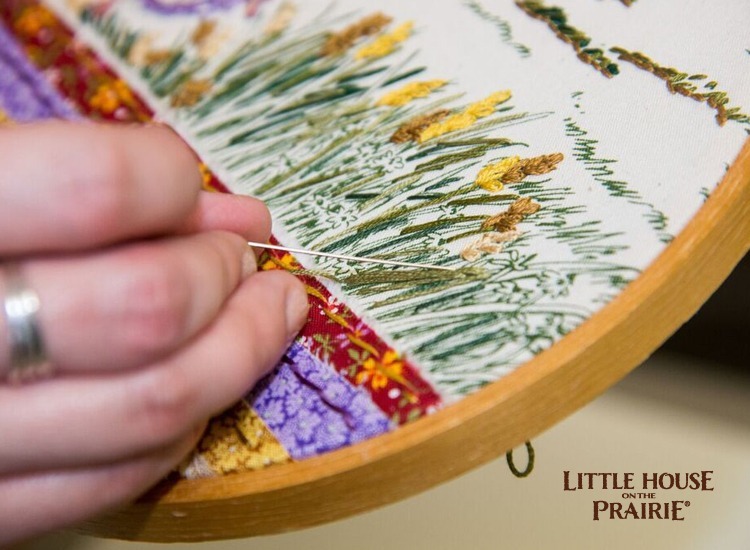 Please share it with us on our Facebook page and on Twitter/Instagram using the hashtag #LittleHouseMoment! 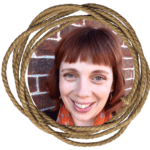 An avid stitcher, thrifter and coffee drinker, Nichole is a self-taught embroidery and textile artist. A collector of threads and fabrics, she loves to combine color and texture and pattern into hoop-shaped palettes. Located in Bucks County, Pennsylvania, she spends her non-stitching time with her husband and two small boys, discussing gardening and trains and Minecraft, usually all at the same time. I have been watching Little House On The Prairie ever since i was the 80’s and still watching them now. 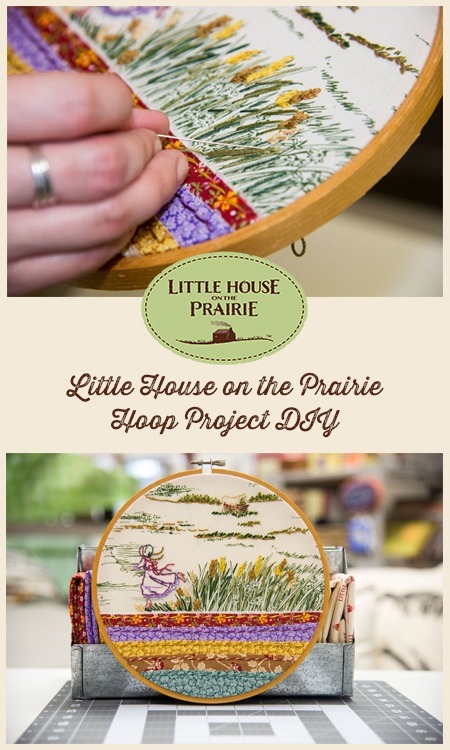 I am trying to save up the money to get the complete series on DVD AND THE BOOKS…..
What a fun and beautiful hoop! Where do I get pattern for embroidery? Is it preprinted with fabric. Love all the Little House fabrics.. I AM AMAZED AT ALL THE WONDERFUL IDEAS AND INFORMATION THIS SITE OFFERS. I AM NOT A HANDS ON QUILTER, KNITTER, STITCHER, EMBROIDERER, OR CRAFTY LADY BY ANY MEANS. HOWEVER, I ABSOLUTELY LOVE SEEING ALL THE ITEMS CREATIVE PEOPLE CAN DO. I JUST LOVE ALL THE RERUNS OF LITTLE HOUSE ON THE PRAIRIE. IT REALLY MAKES ME WANT TO GET INVOLVED IN BEING MORE HANDS ON. THANK YOU SO MUCH FOR SHARING ALL THESE WONDERFUL IDEAS. I’LL PROBABLY MESS UP MY FIRST FEW, BUT I AM BOUND AND DETERMINED TO GET STARTED. Is there a conversion on this pattern for counted cross-stitch? If not, is there anyone who could do that (make this into a cross-stitch pattern)? Do you have the Patten with the covered wagon in a hoop? Oh, this is absolutely lovely! I am a lifelong fan of the Little House books and have thoroughly enjoyed sharing them with my children in the last couple years. I promptly went online an purchased the fabrics and will anxiously receiving them to start my project. I have a couple questions for you as I read through this… With just using the glue stick to apply to fabrics to the bottom part (and then embroidering them), did you have problems with the fabric coming unattached? Also, how many threads of floss did you use for your embroidery? I don’t have a lot of experience with embroidery; I’m more of a quilter. Thank you for your help!